“Protestant novena” may be an oxymoron, because as far as I know a novena is a totally catholic thing. I wonder how many people reading this have even heard of a novena. I never had until this morning. Or, at least I don’t recall knowing about it. I was researching the church holiday “Ascension of the Lord” this morning and came across the term. A novena is a nine day prayer commitment focused upon a specific intention. It seems from what I have read, that the most common is a novena to the Holy Spirit between Ascension of the Lord Thursday and Pentecost Sunday.A novena though may be said at anytime of year and there is no limit to the focus of a novena. According to scripture Jesus appeared to the disciples after his resurrection and continued to spend time with them for forty days. At the end of that forty days, Jesus ascended or more literal “was taken” up into the heavens. The disciples stood and watched as he disappeared into the clouds. A promise was made that the gift of the Holy Spirit was coming soon, which then came to pass ten days later at Pentecost. So, forty days after Easter some traditions celebrate the Ascension of Christ. This year the celebration of the ascension of Christ falls on Thursday, May 13th. In the Catholic church, Ascension of the Lord is an obligatory holy day for all catholics. It is also common to observe a novena to the Holy Spirit for the nine days between Ascension Thursday and Pentecost. Some churches celebrate the ascension on the Sunday following Ascension Thursday. The novena to the Holy Spirit consists of nine days of prayer guided by a verse, meditation and prayer for the day. The first day is sort of a getting started day in which you acknowledge your need for the Holy Spirit. Each successive day focuses upon a different aspect of the sevenfold nature of God’s Spirit; specifically, “the Spirit of Wisdom and Understanding, the Spirit of Counsel and Fortitude, the Spirit of Knowledge and Piety, and the Spirit of Holy Fear.” I put those aspects in quotes because I am completely borrowing here some catholic rhetoric from the novena to the Holy Spirit. While I am not sure that I completely agree with some of the theology I saw used in the prayers and meditations in the catholic version of the novena, I really love the idea of taking nine days for focused prayer around my relationship with God specifically in regards to the Holy Spirit. The denomination that I am in tends to keep the Holy Spirit a bit at the edges. I have often said that if you attempted to express how our denomination regards the different parts of the trinity using fonts, then “God the Father” would be in 48 point arial, “Jesus Christ” would be 12 point times new roman, and the Holy Spirit would be in microfont wingdings. (Refer to the above graphic) Because of this, I think it would really behoove me to spend some prayer time around understanding the Holy Spirit more fully. So, come Friday I am going to write and observe my own version of a novena to the Holy Spirit. Each day for nine days, I will identify a scripture about the Holy Ghost, write a brief reflection, and prayer. I will post each one for anyone who would like to join me. 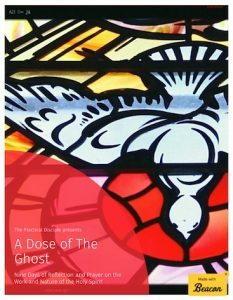 I am going to call each post “A dose of the Ghost.” I have never done anything quite like this, so I will offer a reflection on the experience at the end and would appreciate feedback from anyone who joins this little nine day prayer party. Blessings and may the Holy Spirit be a vibrant presence in your life. Would you like the entire ‘Dose of the Ghost’ series? If so, I have compiled all nine days of reflection and pray into one convenient ebook. The post are presented as published with the exception of the addition of space for you to write your own inspired prayers about the Holy Spirit. You can read the guide in on sitting as a primer on the Holy Spirit or use it as a nine day devotional guide to transform you understanding of the nature and work of the Spirit. Click the button below to download your free copy today. A well researched and thoughtful post. :- ) It is interesting how different churches tend to put a different emphasis on the various elements of the Trinity. I am not Catholic but I like Novenas. I think that form of prayer is a useful tool. Not everyone finds them helpful but many people do. It’s a good discipline. Thank you Robin. I hope the subsequent ‘dose of the ghost’ posts prove to be enriching to you. Blessings in your sewing and painting. I hope you feel Christ with every stitch and stroke. It’s your grateful offering to the world from the gifts He has given you and we appreciate it. Very interesting topic and one I certainly didn’t know much about. I look forward to your coming post as a way to explore a new type of prayer for both of us. Thanks for this series. Thank you Jean. I also look forward to exploring your blog. I took a quick look and you have my interest. Thank you for commenting. John… A Protestant Novena… Very interesting. Being a Baptist, we too tend to leave the Holy Spirit out on the edges much like you explained. Studying scripture though, it seems that the Holy Spirit is the essence through which the trinity relationship exist. I know that it’s not on the same subject of the Novena, which I had never heard of by the way, but I still found that thought as one worth pondering. I also view our different denomination’s emphasis on different persons of the trinity as a part of our identification and function as different members of the body of the Church of Jesus Christ as a whole. 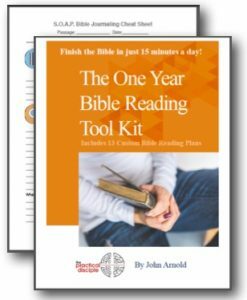 Some denominations seem to focus more on scripture and it’s study, while the next may have slightly different theological differences they focus slightly more on the spiritual side of things, the next may focus even more on spiritual matters but less focus is emphasized in studying of the scriptures, while others may focus more on service and tradition. My point is… I believe that each denomination (member of the church) has it’s particular area of emphasis for a specific reason. I believe that we can all work together because if we believe and accept the gospel then the Bible says that we are in fact brothers and sisters in Christ. God works through us all to try and reach all. The “lost” can and will be attracted by different aspects as followed by the various denominations. We are all working for the same goal of the advancement of the Kingdom and all that intails with salvation and personal spiritual growth. We just have different ways of going about it. Again, which is what attracts some people. I just thought that the emphasis of and earlier post about the different denominations focus was an interesting subject. I love interacting with people from every denomination. The most profound, engaging, spirit filled church services that I have ever attended were multidenominational. This blog is a good way of acheiving the unity that Christ commanded that we have. We may have different traditions and theological outlooks but we are of the same mind and that mind is Christ. John, thanks! Thanks Cliff. I had never heard of a novena either. I loved the idea though of focused prayer and study around a single topic for 9 days; so, I try making my own. I learned more about the Holy Spirit in 9 nine days of focused study and prayer than probably the 9 months prior. From what I read in your other comment I suspect we are very kindred spirits regarding denominations. I have always been very actively involved in multi-denominational efforts and have found those experiences to be incredibly enriching. I think every church has a responsibility to be well rounded in how it spends its time in ministry. Its unhealthy to only be a teaching church, or only worship, or only mission focused, etc. Nevertheless, it seems like different churches and denominations have natural types of ministry they really shine in or are uniquely equipped to do. Again, thank you for you comments. I look forward to hopefully hearing more from you at The Practical Disciple. Hiya. I think this is worthy of exploration. I agree that there is a very different emphasis on God the Father, God the Son and God the Holy Spirit, almost as if there are two and then the conduit from us to them is the Holy Spirit. He is an entity in Himself. I have been (trying to) read a book by Billy Graham called “The Holy Spirit”, which has been quite enlightening. Reading passages and writing prayers about the Holy Spirit really opened my eyes up. You have me curious about the Billy Graham book, let me know how it helped your understanding of the Holy Spirit when you finish.